Interest this week wll be minor I might try call some upsets during the week but this can be a tricky event but then also the prices reflect that. At end of the day when I backed Poulter in 2010 it was obvious match play was his game and he delivered again the Ryder Cup last time out in the format. 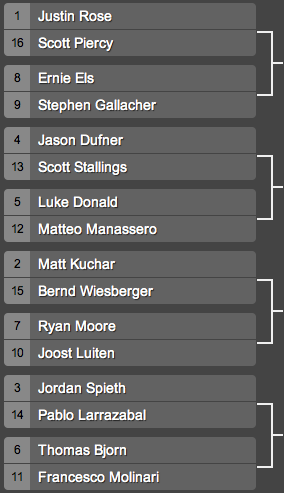 Kuchar was also in my book in 2013, from memory I had my 3 picks make it to the last 8 in 2013. 2012 was barren however or me so it can go either way but as with everything their is value to be had it just might be harder to find. Look at the finalists the ooze good quality players, over the week inferior players will get found out no matter the format. Of the top 64 just Woods, Scott and Mickelson will not be here. Scott is showing a ruthless focus for me right now and it will be a big fail for him this season if he doesn’t pick up a major. Woods meanwhile seems be avoiding been shown up as his game is not in best of order and he is just after picking up a huge check for a recent day out in India. The course is new enough with wide fairways however straying too far off will almost lead to a loss of the hole. Really a good match player here will need to hit long enough but still straight to keep out of trouble a fine balance and usually one that allows the better players to shine over the 5days. Of the 64 matches played at Dove Mountain last year, only seven players led after nine holes and failed to win and five of those were just 1 up through nine. The biggest comeback was by desert golf specialist Rafael Cabrera Bello, who came from 3 down to beat Lee Westwood. Stricker takes the field for this after much debate, De Laet is a fine ball striker but is lacking experience in this sort of event as does Donaldson. Jason Day enjoys match play but has a difficult opening game and is not much of a price either. Simpson has a nice starter game and his route isn’t the worse. Stenson no1 seed has not been too ken of late on this format despite been a past winner way back when. Snedeker is a good player but hasn’t been in same good form this year that Simpson has. Watney and Ooshuizen are two good players but are not playing to their level yet. Rory gets a nice openers here and many will fancy him this weekend, some like me might think it will have a lot to do with how long Caroline stays in Dubai. Westwood and English should be tight both great players on their day. Schwartzel is picking up some form now after a great Sunday and faces recent PGA Tour winner Sadler. Furyk and Kirk another close match up. 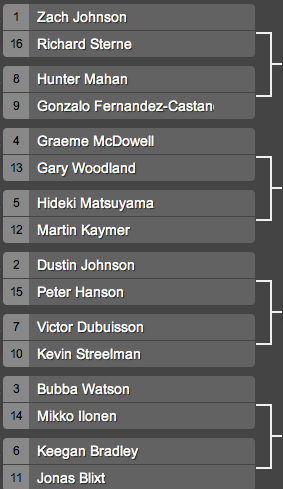 Garcia faces Leishman and that is one I could see Leishman take with his liking for match play. 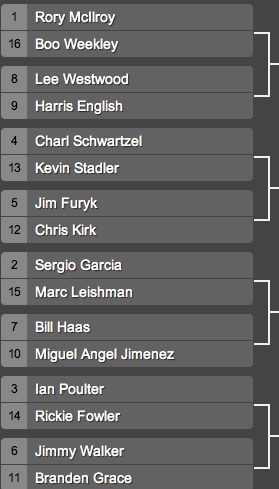 Haas faces Jimenez that will be trickier than it might look for him. Fowler faces a very difficult man to overcome in Poulter and the winner of that will face the in form Walker and Grace. Rose will have a hard opener with Piercy here given his lack of golf this season. Gallacher will fancy his chances if he can get past Els who I feel is their for the taking. Dufner and Donald both would be disappointed not to get out of their openers. Kuchar is defending champion and really should handle Wiesberger with his limited match play experience and lack of US game time. Luiten struggled last week but I do expect a little better now he will have acclimatised but Ryan Moore is a difficult task. Spieth faces Larrazabal and this one looks close for me. Bjorn has Molinari one he should win but Molinari is showing signs of late. This for me looks like the Group of Death. Zach Johnson on paper should like this event but its not always been the case and I wouldn’t think of backing him before he has played. Hunter Mahan a past champ faces a difficult opener Castano is a fighter in this format and likes these courses. McDowell will love this event and Woodland is on of the better openers he could have doped for. Matsuyama has great chance v Kaymer who isn’t the player he has been when such a good match player. Dustin should be getting through his quarter and I am so tempted back given his recent form but he seems to stutter with a bad day in this format. Interesting that Dubuisson has been here for 2weeks now and done line he might be someone to keep on side. Bubba Watson is in fine form and his few errors from last week should not matter in this format. 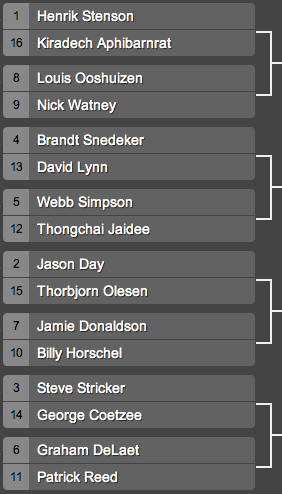 Bradley v Blixt is the last match up and looks a close call. 2pts Web Simpson 33/1 betvictor – A pick of mine for the PGA Tour money list he has been nothing if consistent so far this year and has a strong record in match play. He got to the final 8 last year and good signs with a useful draw. .75pt Stephen Gallacher 125/1 various – I believe he can upset in the first round and could get on a role. Lost first round last year but getting Poulter was unlucky. Has a game to suit here and could go in at a price. 1.5pts Hunter Mahan 25/1 betvictor – Winner and finalist last two renewals. putting well currently. 2pts Ian Poulter 33/1 various – Comes out to shine in match play format and of course a past winner of this and was out of this world in the Ryder Cup last time. Took 40s on exchanges early in week. 1pt Jason Dufner 66/1 betvictor – Has two first round losses to his name but record in other match play is pretty good. I will look trade the WGC Match Play Championship more so the above bests are small stakes.